This is the third letter in a weekly series of letters that I’m exchanging with Dee from Red Dirt Ramblings in Oklahoma (zone 7a) and Mary Ann, the Idaho Gardener in Idaho (zone 6). It's about 750 miles or so to drive from my garden to Dee's, and about 1,470 miles to get from Dee's Garden to Mary Ann's. Then it would be another 1,820 miles to drive from Mary Ann's garden back to mine. But fortunately, with the Internet our gardens seem much closer than that! Greetings from May Dreams Gardens. As I sit here writing this letter, I can look out into the backyard and see just the slightest bit of green on the tips of a lilac shrub and hear birds calling to each other as they flit from the feeders to the trees to some nearby Viburnums. I love spring in the garden! This past week, I sowed the early spring crop seeds in the vegetable garden right on schedule on Tuesday, St. Patrick’s Day. It was a beautiful evening and we had a high temperature somewhere in the low 70’s, so conditions were ideal for sowing seeds. Then Wednesday evening we had some good soaking rain showers, a little over half an inch. I don’t think my seeds have ever had such a perfect week to be sown. Because of my raised beds, all I had to do to prepare for planting was rake the beds smooth and pull a few clumps of henbit. I sowed seeds for peas, lettuce, spinach, radishes, bok choy, swiss chard, turnips and sweet peas. I also planted out some onion sets. Somehow, I ended up with eight varieties of lettuce this year. I have two French varieties, ‘Mereveille Des Quatre Saisons’ and ‘De Morges Braun’ and two mixes, ‘Pinetree Mix’ and ‘Gourmet Baby Greens’. Plus I bought two of my favorites, ‘Tom Thumb’ and ‘Big Boston’. Then I had to get ‘May Queen’ just for its name. I thought that was it, but then I got a back-ordered packet of lettuce seeds for ‘Matina Sweet’ in the mail a few days go. When I was growing up, my Dad planted mostly bibb lettuce and black-seeded simpson. I wonder what he would think of all my fancy lettuce varieties now? Or for that matter, the raised beds, because he always had a traditional garden. But I know he'd be proud of my hoe collection! Did you know one of the first hoes I ever bought was a Father's Day gift for my Dad? Anyway, enough about the lettuce and my hoes. I always have to cover my raised beds with white cloth to keep the rabbits from eating my lettuce and peas before I can harvest any for myself. But, I'm not going to cover the raised beds until I see the actual seedlings, which should be any day now. Yes, I know I’m taking a chance that the seeds will sprout when I’m busy and the rabbits and birds will find them first before I can get out there to cover them. But in the back of my mind, I still think of all the wildlife in my garden as my friends and fellow helpers. I imagine the birds are circling around above me, in somewhat Disney-esque fashion, whistling happy little tunes just for me as I hoe and rake. And the rabbits are hopping ahead of me just out of my sight, ready to run back and alert me if they should see any slithering snakes or venomous spiders ready to cross my path. But I know that’s far from the truth. Early yesterday I saw a red-headed woodpecker pecking away at my honey locust tree. I’ve enclosed a picture of it that I took through the window. 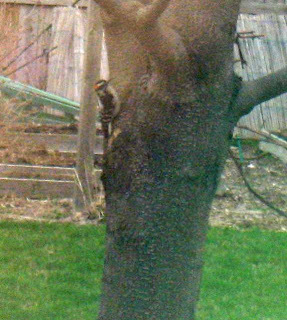 I often hear woodpeckers off in the distance, but rarely see them in my yard. I don’t think this woodpecker was doing that “drumming” they do to attract a mate or mark their territory, nor do I think it was trying to create a hole big enough for a nest. If he or she was, well, more power to them, but they’ve got a long way to go. The woodpecker left a small hole so I think it was just trying to get to some insect just under the bark. Now I need to go out and inspect the tree more closely, just in case it is harboring some borers or something like that. Then I’ll likely be online or looking through some of my books to see if I can find out more about either the woodpeckers or any borer holes I find. That’s what makes gardening so fun and interesting, and sometimes challenging. No matter how much you know or think you know about gardening and plants, you are bound to see something in the garden that you don’t know anything about, and it sends you back to the books (or the Internet) to learn even more. Speaking of learning, I’ve been reading up on worm composting and am all set to order some red wigglers tonight. I’ll have the worms’ food and bedding ready before they get here so they can hopefully forget the travails of traveling, settle in to their new home quickly and get right to work on turning my kitchen scraps and junk mail into good compost for my garden. I’ve also got some good compost buried in my compost bins, so this week I’m going to work on turning the piles so I can get to that good stuff and spread it around on the raised beds in the vegetable garden and some of the perennials. And toward the end of the week, I’m going to sow more lettuce and radish seeds, because this is the year I promise to do better with succession planting in the garden. “Hold me to it”! P.S. Most of the tomato and eggplant seeds have sprouted in the sunroom so I’ve thinned them back to one plant per cell by cutting off the extra seedlings. The peppers are just getting reading to sprout; they generally do take a few days longer. Germination seems to be good for all varieties, except the tomato ‘German Johnson’. That’s one of my favorites, so I’ll be watching closely and may have to re-sow those. How are your tomato seedlings coming along? It's interesting that you are growing so much food, Carol. Will you be able to eat it all? I'm sure it will go to friends and relatives if not. All your seedlings sound very cool; I look forward to seeing them come up and turn into something. Somehow, vegetables seem miraculous in that way--more so even than flowers. I'm hoping to get out tomorrow to plant some vegetable seeds. The weather was nice here today, but my back was letting me know that I overdid the yardwork yesterday! Hi, Carol -- one of my favorite woodpecker stories came in November 2000, when I was intrigued by a red-bellied woodpecker hanging around the suet feeder. I looked it up and found that one of that woodpecker's common names is chad. There were lots of hanging chads in the news at the time, so for my column that week, I wrote about my hanging chad. I don't think you can be a gardener for very long without getting interested in birds. What no sporks this year? Hope the rabbits and squirrels are kind to your seedlings. Hope that German Johnson shows some leaves soon, Carol - doesn't it realize its destiny may be the royal pillow of the First Tomato? You should have some very fancy salads if all 8 kinds of lettuce make it to the picking stage! While at the Farmers' Market today, my mom told the grower she wanted a tomato that tasted like the ones her grandmother used to grow. We decided on a Cherokee Purple. Here's to tasty tomatoes for her and for you! I chuckled at your last post with the palm tree; sometimes I think these landscapers are more concerned with eye-catching displays than thinking about reality. I am an avid reader of your page now. I started my own raised bed a few weeks ago. I planted lettuce, peas, spinach, and broccoli rabe last weekend and have hundreds of lettuce sprouts and a few broccoli rabe sprouts this weekend. I'm very excited. I put a few bok choy and broccoli plants that I picked up at Lowe's this weekend in there also, but as more of a test to see if the deer or rabbits will bother them. What type of cloth do you use? Cheesecloth? I ordered my worms over the weekend and my worm bin is ready for the little guys, who should arrive by Thursday. I can't wait to add Worm Rancher to my resume. I wonder you have time to work Carol you're such a busy bee in the garden. i love the way you pave the way for us. I, too, have been thinking of a wormery. It seems I am wasting my time putting it on the compost pile because it is so dry and anything good is snaffled by critters. Composting doesn't seem to work well with no grass although I suppose it will happen in the end. Mind you when we leave town I would have to call on someone to take care of it or take it with me! I have a couple of covers on my beds. They were made by D and are absolutely perfect. I'm hoping this year I will grow squash without the borers getting to them. We have also talked about one for the tomato beds. Our garden may end up being an Eden Project. I've never worried about the woodpeckers that visit my trees. Of course that's probably because the trees they peck at aren't ones I've planted. I don't usually worry about pests in the trees, but now that we in Chicagoland have to worry about the Asian Long-horned Beetle, I do try to monitor the trees for it. I'm thoroughly enjoying these letters. Thanks for sharing them. I'm amazed that your AccuWeather widget is showing 67ºF! We're at 33ºF right now and the wind has been frigid.